Phillip and Elizabeth’s relationship has existed in a realm of grayness from the jump, and has only gotten murkier as the weeks have gone on. “Duty And Honor” continues that trend—as well as The Americans’ hot streak—with an exceptional episode that digs deep into the muck of uncertainty surrounding their obligations to each other, to the KGB, and to themselves. This is, if I recall correctly, the first we’ve heard of Irina, the woman Phillip was involved with in Russia when he took the first steps on the path that led him to America and Elizabeth (unless there was a reference to her in their argument over Gregory that I’ve forgotten about), but it’s evident from Elizabeth’s reaction to his reunion with her that it’s not the first she’s heard of Irina. Phillip’s mix of trepidation, nostalgia, and excitement surrounding his mission with Irina, combined with Elizabeth’s uncharacteristic unease and anxiety during his time with Irina in New York, reveal some of the deep fissures in the foundation of their marriage—fissures that have grown deeper in the wake of Elizabeth ratting out Phillip last week. The extreme tension between the couple when she drops him off at the train station—so many trains this week!—adds a lot of emotional heft to Phillip’s reunion with Irina, as well as his and Elizabeth’s eventual reconciliation. Those final moments, when Elizabeth apologizes and tells Phillip she wants to really try with their marriage, to make it real, seem like a major turning point in this series. She’s been honoring her marriage within the context of her duty to her mission; now she wants to honor it as an actual relationship. And while Phillip agrees to the thing he’s ostensibly wanted from the beginning of this series, the lie he tells Elizabeth, that nothing happened between him and Irina while he was in New York, is itself a betrayal, but one told in the service of honoring their marriage—or perhaps their mission. Again: shades of gray. “Duty And Honor” extends these themes well beyond the central relationship—in fact, I’d say this is the most thematically strong episode of this series thus far. The “mission of the week” element of The Americans usually works in service of deeper revelations about the characters, and Phillip’s mission to discredit the leader of the Polish liberation movement, which stirs up his past with Irina, is a prime example of this. But the mission also serves as a thematic mirror. Andrzej Bielawski—who, as far as I can tell, is a fictional construct whose surname I am totally taking a shot in the dark on—is a former hero of the Communist party whose religious conversion turned him against the Soviet Union. I’m sure it’s no coincidence we meet him the week after Phillip and Elizabeth’s confidence in their own leadership was so dramatically shaken. Of course, that doesn’t stop Phillip from doing his duty and working with Irina to cast aspersions on Andrzej’s honor, forcing him to step down so his enemies can’t discredit him with offenses he never actually committed. Stan, on the other hand, does actually commit the transgression we’ve been predicting for a while now, sleeping with Nina—and while Sandy is at home putting on a brave face for Elizabeth, no less. I have to admit, this happened sooner than I was expecting, though I like that it was paired with Phillip’s time with Irina. Todd, what do you think of this development and its place in this episode? And where does Elizabeth’s solo mission to get intel from Sanford the degenerate gambler fit into all this? But first, the most important question raised by tonight’s episode: How many legwarmers is too many legwarmers? But I’ll be honest: “Duty And Honor” hit me almost directly where I live. There were two scenes—that late-night phone call and the final one—that very nearly made me cry, and TV rarely provokes much of any emotional reaction in me at all. I’ve always thought the real strength of The Americans was that it embedded its admittedly nifty spy subplots into a fairly universal story about just how much work marriage could be, and if the series could seem like it’s endlessly spinning its wheels in this regard (“You work to make this marriage real!” “No, you do it!”), it hasn’t seemed that way yet because this is just the simple truth. Marriage is a choice you make daily to indulge in hard work. Rewarding work, yes. Work that doesn’t feel hard if you’re with the right person. But hard work nonetheless. The brilliance of the series is that it takes that idea and externalizes it into a spy genre that wouldn’t occur to most writers. In an episode like this one—as you’ve so elegantly pointed out—it becomes a never-ending cycle. The marriage stuff feeds the spy stuff and vice versa. What’s interesting is that Phillip and Elizabeth’s fake marriage feels so much more real than Stan and Sandy’s “real” one, which is why Stan’s betrayal of his wife felt less heartbreaking to me than Phillip’s completely justifiable (in a professional sense) hook-up with Irina (played, I should add, with real soul by Marina Squerciati). In some ways, a marriage that falls apart already fell apart long before anybody made a move in some other direction, and the Stan and Sandy marriage has been on life support for a long time. Stan does this bad thing and gets to be the bad guy (assuming anyone ever finds out, beyond Stan’s boss, who clearly knows). But this has been brewing for a long time, maybe even since before Stan left for his undercover assignment, and both partners played some role in it, even if the series doesn't go back far enough for us to notice (season two?). I'm not trying to downplay Stan (and his employer's) role in all of this. But I think both Beemans made an assumption that they could simply resume their marriage as it had been, and that… wasn't the case. In contrast, by trying to build the most believable fake marriage they could, Phillip and Elizabeth have accidentally built what could be a very strong actual marriage. The parallels drawn between these couples feel a little neat, conceptually, but in practice, as written by these writers and played by these actors, these developments feel heartbreaking and inevitable. The episode of television this reminded me the most of was The Sopranos’ “College,” which is pretty heady praise for a TV show, given that that’s one of the most famous (and one of the best) episodes of TV ever made. But aside from the obvious plot parallels—the husband goes away on “business,” while the wife stays home and has some searching conversations about her marriage—I was also struck by the way this episode has bearing on what’s happened so far this season but is also a mostly standalone adventure, just like “College” was. (And I do believe we saw Phillip ripping up a photo of Irina earlier this season, but that was the only time she was seen or mentioned.) Elizabeth “buying” Sanford feels a bit awkward under this rubric, but that’s probably a necessary nod to the increased level of serialization we have nowadays, and it’s yet another example of how all relationships, eventually, become about careful negotiation. But, in some ways, I was predisposed to like this episode. Written by St. Elsewhere, Northern Exposure, and I’ll Fly Away co-creator Joshua Brand, one of my favorite TV writers who’s been gone too long, “Duty And Honor” felt like a reminder of both what was so good about TV back then and what’s so good about it now. Now, granted, I have no idea how much Brand contributed to this script beyond an initial draft. TV shows are so collaboratively written now that to say, “Hey, this guy wrote this!” is a fool’s errand. But some of the beautiful, elliptical dialogue—particularly in the conversations between Irina and Phillip—struck me as something that could have issued from his pen, and I was glad to have that touch of something almost poetic here. I could write another 2,000 embarrassingly personal words about this episode, so I’ll throw it back to you, instead. For me, one of the great things about this show is how it’s making the choice to end every episode it can in Phillip and Elizabeth’s bedroom, a perhaps obvious structural choice but one that’s already paying dividends. So for me, this all came down to that final scene. But I want to ask you this: How long can the show keep reversing which partner is lying before that starts to feel a little hollow? Or, alternately, do you think this episode is arguing that all good relationships have to include a few significant untruths, meant to protect one party’s feelings? Genevieve: Well, I think all dramatic depictions of good relationships have to include a few significant untruths, because narrative convention dictates that those lies have to be revealed eventually, further propelling the story. Pretty much every time Elizabeth or Phillip has hidden something from the other, or left out a significant detail or two, it’s come out: Elizabeth getting raped, her relationship with Gregory, her snitching on Phillip to their handlers. (Come to think of it, it kind of seems like Phillip is due for a good lie, just to even things out.) And when those truths come out, they’ve eventually led, after some requisite angst, to a deeper connection and understanding between the two of them. 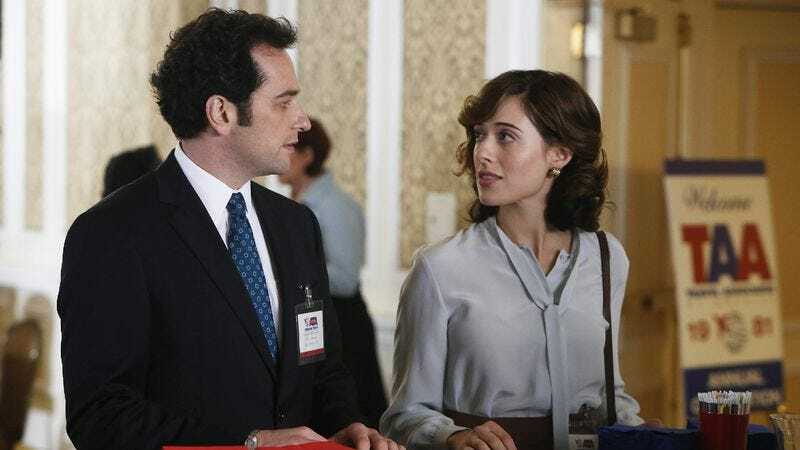 The Americans has the somewhat tricky task of depicting a fundamentally new relationship within the context of a relationship that’s going on 20 years old. In order to hit certain relationship-y emotional beats—the first realization of devotion, the sting of betrayal, learning to trust despite one’s instincts—situations have to be manufactured that put these two off balance around each other. They lie now so they can learn later. Could that get old down the line? Sure, but I think so far, The Americans has proved itself smart about finding the universal emotional core in within its extremely heightened situations. If it keeps that up, I’ll follow it down whatever twisty path it chooses to go.